Hinger Health Care Private Limited - Importer of 100% whole colostrum, health care products & cosmetic items since 1994 in Mumbai, Maharashtra. 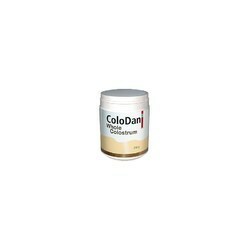 The ColoDan® product range is made from Danish colostrum with a guaranteed high content of nutrients and free of residues of antibiotics. We are working closely with a large number of local cattle farmers who supply their surplus of colostrum to us. The first 4 litres of colostrum will be administered to the calf, as it is crucial for their survival. Only surplus colostrom from the 1st milking and colostrum from the 2nd milking (max. 24 hours after parturition) are supplied to us. This ensures high levels of immunoglobulins, growth factors and antimicrobials. The colostrum powder is produced using gentle processing. Special measures are taken in order to produce a high quality product with a preserved content of bioactive substances, a high microbial standard and free of antibiotic residues. Colostrum from us differs from other products in the market – such as pills, capsules and fat-free concentrated powders – by having a nutrient composition equal to the initial colostrum.